No new recipes today…Today’s post is straight from the heart (and a little long, sorry about that). Recently I’ve been doing a lot of work on my blog and it’s got me thinking about some of the things I’ve learned over the last year and a half. -Blogging is hard. It’s hard to find several hours a day to devote to blog writing, reading, cooking and taking pictures. It’s hard to constantly be creative and try to think of new things that you haven’t blogged about, let alone anyone else. It’s hard to be organized enough to line up guest posts or prep extra posts when you have a busy week coming up. But I make time and I put in the effort, because I love it. -You could easily drown in the sea of social media if you let yourself. When I first started blogging, the only thing I worried about was publishing the post. Occasionally I’d share the link on my personal facebook page. That was it. Then I made a facebook page for my blog. Then I got a twitter account. Then I joined pinterest. And now, it feels like between stumble upon, posterous, tumblr, foodbuzz, youtube and others, that there are million other social media sites that I’m not even using…and quite frankly, I don’t have time for all of them. So I choose to stay active on the social media sites I enjoy most, instead of stretching myself a million different directions and not enjoying any of them. -You will get jealous of other bloggers Do I get jealous when a blogger gets their 98th picture accepted by Foodgawker while I can’t get them to accept even one of mine? Yes! Or when someone makes it into the Foodbuzz Top 9 for the 10th day in a row? Absolutely. Or when someone gets the same number of pageviews in a day that I do in an entire month? Sure. But I’ve come a long way since I started blogging because I realized that it just doesn’t matter. I can be happy for them and their successes, while still being proud of myself and the things I’ve accomplished. I can work really hard on a recipe or a post and just because it doesn’t get a certain number of page views or pins or whatever, DOESN’T MEAN IT ISN’T AN AWESOME POST! If you find yourself being jealous of other bloggers, remember that somewhere, someone out there might be jealous of you and the amazing things you’re doing! -You don’t have to do everything other bloggers are doing. On the food side- You don’t have to spend 1 hour after you cook a meal taking pictures of it every single night. If you’re not in the mood, snap a quick picture and dig in. Your blog can still be successful if you don’t take amazing pictures. One the fitness side- You don’t have to go out and run 20 miles every day to call yourself fitfluential, a runner or an athlete. If running 3 miles is hard for you, then every.single.time you run 3 miles, you should be proud of yourself because that is an accomplishment for YOU. Quit comparing yourself to others and start celebrating all the awesome things you can do. -No one can make you feel inferior unless you let them. There is absolutely no reason why your 20 minute workout can’t be considered just as good as someone else’s 2 hours of running. I’ll probably never run a marathon…let’s be honest, I can’t run more than 4 miles without a) feeling like i’m going to die and b) being just plain bored. I don’t enjoy running long distances, so i’m not going to do it. I do enjoy putting together an amazing 20 minute circuit workout and calling it a day…so that’s what I’m gonna do- And that’s fine! -You don’t have to blog multiple times a day, or even every day to be successful. There are bloggers out there who religiously blog 3 times a day. And there’s nothing wrong with that. It works for them…I admire their dedication and their ability to come up with that much stuff to talk about. And I read those blogs and love them…but I’ll never be like them. AND THAT’S OK. It took me a long time, but i finally realized that I don’t need to blog every day in order to keep my readers. In fact, sometimes I go three days without blogging, and guess what! NOTHING happens. People still read when I do post, they still comment, they’re still there if I decide to put living life ahead of blogging. And just because I don’t blog every day doesn’t mean i’m not dedicated to my readers. Blogging is supposed to be fun! If I turn it into a chore/competition/requirement, then what’s the point? -Just because you’re a food blogger doesn’t mean you have to like all the same foods as everyone else. I don’t like kale chips, or coconut water, or dates filled with peanut butter … And I don’t have to pretend to like them just to fit in. -Numbers don’t have to matter I realize that some people blog to make money or as their full-time job…and to them, it probably does matter how many page views they get because for them, page views = pay check. And that’s fine. But that’s not me. Blogging is not really a source of income for me. Sure I make a little money here and there….like enough to treat myself to an extra frozen yogurt, or occasionally pay someone to do some behind the scenes techy stuff to my blog…but it’s nothing life changing. AND THAT’S OK! When I first started blogging, I looked at my stats page every day. I let whether I had a lot of page views or not as many as normal control my mood. It stressed me out constantly and I was always feeling pressured to do something bigger and better. So I stopped looking. Quit cold turkey. Now I never look at my numbers unless I have to submit them to a company for an opportunity. And it was so freeing! I know not everyone takes this approach, and that many people will continue to check their numbers all the time…but for me, it works. It helps me keep myself in check and helps keep blogging what it’s supposed to be- FUN. I blog because I want to, and it doesn’t matter if there’s one person reading my post every day, or one thousand. *This doesn’t mean I’m not interested in growing my blog, gaining readers or making improvements to my site…it just means that I’ve learned to not let the numbers dictate my feelings or rule my life! -The blogging community is the most inspirational & motivating group of people I’ve ever been a part of. I’ve never been surrounded by so many amazing people that share the same interests as me, get excited about the same things as I do or are as supportive as they are. If I’m lacking motivation to go work out, I turn to Twitter and am usually up off the couch within 5 minutes. If I don’t know what to make for dinner, I just open my google reader and I usually have about 27 ideas by the time I’m done reading all the new blog posts. If I have an amazing workout and I tweet about it, I immediately have at least 5 people telling me what a good job I did or how awesome I am. It doesn’t get any better than that. -You can make good friends through blogging. Even though I’ve met very few bloggers in real life, there are several that I consider to be some of my best friends. I email them about life and they can relate. I text them when I’m stressed about school because they’re going through the same thing. I send them packages on their birthday because I know it will make them smile. It’s been an amazing way for me to find some new friends, which is something I never expected would happen when I started this blog. Embrace every opportunity. You never know when one will positively change your life for the better! -After all your hard work, you will have something you can be proud to call your own. When I started my blog, I had no idea how long it would last, or how much a part of my life it would become. When I look back at some of my first posts, it’s fun to see how much I’ve grown as a person, developed my identity as a blogger and gained confidence both in blogging and in life. And you know what? I’m freakin’ proud of myself. I’m proud of how awesome my blog looks. I’m proud of how many hours of work I’ve put into blogging. I’m proud of myself for the times I’ve stepped outside my comfort zone. I’m proud of all the new foods I’ve tried. I’m proud that I’ve inspired other people to make healthier choices…. And if you can relate to this post at all, I hope you’re proud of yourself too for all the amazing things you’ve done with your life! I hope you’ll stop comparing yourself to others, stop trying to be someone else…and start to enjoy just being you! Sunday’s Workout: I seem to be in a running mood this week, but sometimes I like to break it up with a little break or two. I set out with the goal of running 3 miles total, one mile at a time. In between, I did three 4-min tabatas to give myself some active recovery! 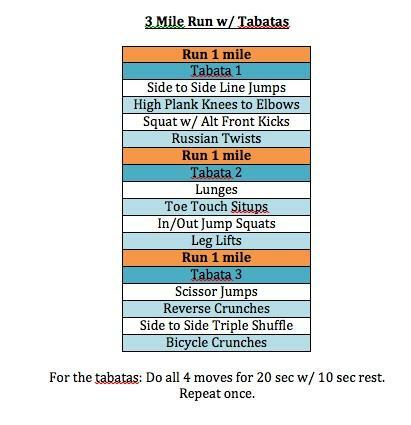 I ran the three miles in 27:52 (9:17 pace) and each Tabata took 4 minutes. I rested for 1 min after each Tabata. I set the treadmill at 6.5mph for each mile. It was tough, but not impossible. By the time I got halfway through the last mile, I wanted to take the speed down to 6.0 SO BADLY but I fought a mental battle with myself and told myself I could do it at the speed I was at, and I did! Suddenly it was 11pm and I hadn’t done my workout yet! After 2 days of cardio I decided to do some heavy weights w/ some of my fav arms & legs exercises. thanks girl! isn’t it the worst?! Thanks for sharing your wisdom with all of us! It definitely helps someone like me who has just recently started blogging. SO often, I am having to remind myself that I started my blog for ME, not for anyone else. Bloggers like you just inspire me to get better at what I am doing on MY blog! awwww you’re the best!! never stop blogging for you!!! Love this post, completely agree with you on everything! I agree, I am proud of how far I have come with my blog, and how much I have grown with my blog. It makes me so happy, I simply love blogging, and I adore all the friends I have made in the food community! This is why you are one of my favorites. post from the heart more often–because i simply loved this! & I wanted to say thanks for encouraging me to run when I’m a lazy bump on a log. It is appreciated! This is such an AMAZING post Lindsay!!! Life/blog balance is soooooo important! Love this times a thousand! I totally agree with everything you said here. Especially about how I’m proud of myself for my blog. I feel like it’s something that has really helped me become more confident in who I am! me too!!! and that’s why i love it. it’s done so much to positively influence my life, it’s amazing! Fabulous post Lindsay! Seriously…awesome :). as a new blogger myself… this is awesome! thanks for the great reminders! you’re welcome!! keep up the great work with your blog! it’s awesome. so so so so true. I’m proud of you too! I love this post. Agree on every point you made! This is a great post! Comparing yourself in the blog world is incredibly tempting and easy to do, but definitely unhelpful and damaging to us. Thanks for the great reminders! Wonderful post and reminder 🙂 and I am very proud of every mile I wog because it is a challenge to me… And that’s ok! I love blogging because everyone’s page reflects who they are, and that’s what makes it awesome. exactly!!! everyone is their own person and that’s what makes everyone’s blog fun to read. how boring would it be if they were all the same?! Great post, as always, Lindsay! I feel the same way, though I couldn’t have said it half as well. Your writing is TRULY ‘from the heart’! love this! it’s so true. I am competitive by nature and have had to reign it in several times when I start getting jealous of other bloggers! it’s definitely hard when you have a competitive side. i do as well…that’s why i need these constant reminders from myself and others! You are wise beyond your years…I know people much older than “twenty something” that struggle with these very things and not just in blogging. Very inspirational Lindsay. Thank you for reminding us all what is important. And it’s SO true that this group and community is SO encouraging 🙂 I Love it! I LOVE this post and can relate to EVERY talking point (even though I am not a foodie blogger). 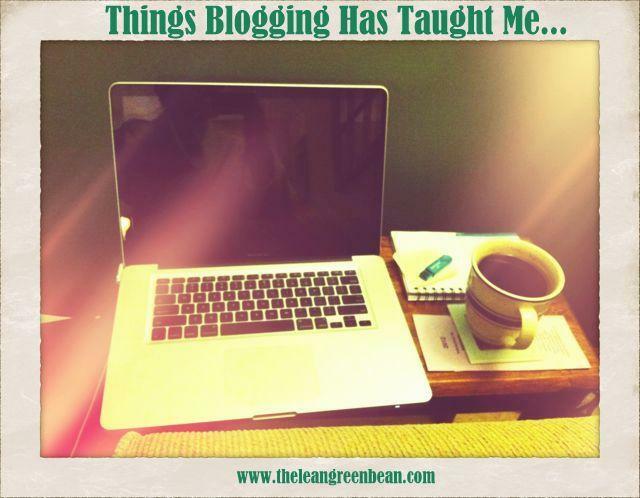 There are so many degrees of blogging! yes there are! i’ve been so happy to hear i’m not the only one dealing with these thoughts! Beautiful post! Thanks for always being YOU! 1. I get jealous of YOU because I don’t know how you manage to stay on top of twitter and you seem SO popular (especially with the genius that is the foodie pen pal exchange). 2. I was just this weekend musing about what would happen if I stopped posting on the weekends…would people still read what I had to say? 3. I love blogging, but it is hard. I feel like I’m in a slump right now. 5. Thanks for your heartfelt words. They are nice to hear. 6. Can you buy ME some frozen yogurt (well….sorbet?) with some of that money? awww, sad to hear you’re in a slump. but you’re still awesome. thanks so much for being my friend 🙂 ps….give blogging on weekends a break. i bet you’ll be surprised how nice it is and how little of a difference it makes to readers. then come visit me and we’ll get sorbet! Awesome awesome post! Incredibly real and I 100% agree with every word. LOVE this post! Blogging has been such a positive experience and I’m so glad I decided to do it! I have a bad habit of getting hung up on my numbers of views and comments and sometimes I let it stress me out…I need to totally calm down and use your approach! for sure…it’s not at all worth getting stressed about 🙂 do it for you! and cuz it’s fun! Mom Is incredibly proud of your blog and all you do with it! I am even more proud of your reflections on why you do it and what’s important to you! LOVE this post! It really is hard work and time consuming. I couldn’t juggle it myself, but I am so glad that you do, because I enjoy Lean Green Bean very much! Keep up the great work! Absolutely LOVE this post!!! All of it is so true. Blogging is hard, but it’s the community and friendships that make it 100% worth it. Great tips! you’re welcome! never forget it!! I love this:) I completely agree with your points! And I love how blogs can be motivating–like you said about getting on twitter, I do the same thing. If I’m struggling to get to the gym, I always check out one of my favorite blogs and see what crazy activities that person is doing and it always motivates me! isn’t twitter the freakin’ best?! i love all my motivational twitter friends. AWW GREAT POST! I can completely 100% agree with everything you wrote. I sent your post to my boyfriend and he replied “u can seriously relate to that!! !i can relate to it just listening to you talk about blogging”. Thanks! You made me feel proud of myself today! *LOVE* this post. It’s hard to not get caught up in trends and numbers, but these are really good things to keep in mind! YES! Don’t get caught up on numbers. Readers are fickle. They might like one topic one day, but be bored with it the next. Keeping things fresh, trying new things, etc is what works! ugh, girl. i’ve tried. i just can’t get on board! This is beautiful and spot on! thank you so much! keep focusing on yourself and being happy and everything else will fall into place! THANK YOU! Lindsay, these words/ramblings of yours mean a lot to a still-newbie blogger like me. Thanks for the encouragement and reminder that it’s OK to do things at my own speed in my own way. aww you’re welcome!!! your blog is AMAZING! keep up the great work. You’re wonderful Lindsay!!! Thank you for this post. You are spot on and an amazing blogger. You should be proud of what you’ve done in 1.5 years! My favorite quote from your post is “I don’t like kale chips, or coconut water, or dates filled with peanut butter” — SO TRUE. thank you so much girl! i love you and all your support! I am guilty of all these things and this was a great reminder that a. It’s normal and b. It’s better to do your own thing and more important to make sure you’re happy. Great post! Definitely echoes a lot of the same feelings I have about blogging. I blog for me & for my friends & family and if other people are interested in what I blog about then I’m happy to have some followers but definitely don’t expect it! you’re welcome friend! thanks for reading! I related to so many of these items. It’s always nice to know you’re not alone in the world on fears or insecurities. i know! this post has made me realize how many people are going through the same things i am! I love everything you just wrote, because it makes complete sense. You are supposed to just have fun. I use mine to vent, share stories, maybe post a recipe I’ve tried. Mine is so random, but it is exactly how I like it. If people read it great, if people don’t its okay. Keep writing your blog, also thank you for letting me participate in the Foodie Penpals, I think its great. Great post Lindsay! I agree with so many of your points. Blogging is really hard and it is easy to feel discouraged and bogged down….if you let yourself. I reminded myself at the beginning of this year that it is supposed to be fun and it’s not fun when I’m constantly worried what others are doing and comparing my blog to theirs. Thanks for all of these reminders and the support. Your blog rocks and the Foodie Pen Pal program is one of the coolest things I’ve been a part of. Keep up the hard work!! you are so sweet! love you and your blog! Right back at you, Lindsay! Great post, Lindsay! Love everything that you said! Wow… this is great! Thank you so much for sharing; your thoughts are certainly something we can all relate to. well said! love this post!!!! we totally agree with your key points. we have learned some of the exact same lessons you did. which I think is another great thing about blogging, that there are other bloggers out there going through and feeling the same things you are 🙂 and the blogging community is such an amazing community! okay where have you been…how come we are just finding your blog now?? thank goodness for FitFluential! wonderful post, hands down one of the best “blogging” post I have read. you are so right with everything. and both my sister have freaked out numerous times over if we do not post our readers will get mad or everyone says be consistent. but sometimes life happens and we cannot post. or we stress because we have no idea how to use stumbleupon, we try not have no idea what we are doing. it is hard to keep. we hate to feel like we are missing out on something, but like you said – blogging is fun. so need to stress! great post! and sorry for the long comment. i’m with ya! fitfluential rocks 🙂 it’s so nice to hear i’m not the only one that’s let myself get stressed out over things like that. but also nice to hear that people are trying to remember that blogging is supposed to be FUN! i love you guys! Awesome post Lindsay! It is this type of writing that keeps me coming back to your blog again and again… and your recipes and workouts:) I loved your line about feeling inferior. “Nobody can make you feel inferior without your consent” is one of my favorite quotes. Keep doing what you are doing girl! thank you so much! and thanks for reading 🙂 you’re awesome! GREAT GREAT post!! Thanks alot!! I loved this. I was just telling a fellow blogger that I blog for me, and if others enjoy it, then good, if not, it’s all about the memories for me. that’s the best attitude you can possibly have! true true and true!! I love your perspective Linz! Blogging finds a place in our heart when we learn how to incorporate into our current life, not vice versa, yes? And i love how this community is so supportive!! blessing indeed. it’ll definitely always have a place in my heart. another unexpected blessing that i never would have imagined when i first started my blog! AMAZING post!! I have no biz being awake right now, so I will try to remember to share/tweet/fb it tomorrow, but this is awesome!! There are so many things you wrote that I can definitely relate to! Thank you for posting this!! Insomnia is keeping me from being able to say something more heartfelt, but please know this post was so good for me to read! 🙂 Thanks a bunch!! thanks SO much 🙂 it’s been so awesome to hear how many people can relate! okay sorry, Lori just informed me she knows about you and reads your blog, just did not tell me,LOL so sorry for any confusion. I care much less about page views than I used to…because the relationships matter most. I have made AMAZING friendships…some of my closest and feel completely understood here. I have been driven to follow my dreams. I love blogging! Love you too! Great post. thanks friend! love you too!! i’m still so amazed by how many awesome people i’ve met! Umm-AMAZING post my friend!! I think you pretty much covered so many basic worries and concerns I have about blogging. At times I think about just stopping because I tell myself I can’t really do as well as I want. But at the end of the day, I’m trying that makes me proud – of me! And I got to meet a great friend like you!!!!!! awww, SO glad we met!! don’t stop unless it’s not fun anymore! I agree with this list! In the beginning it’s super easy to get overwhelmed and the blog becomes “everything.” I quickly realized that I did NOT have to spend as much time as I was on it. I now post usually once a day, and I tweet and facebook about the post no more than twice in one day. I just don’t have time. Comparing myself to other bloggers is hard, but honestly I’m just telling my story and doing my own thing. It’s not a career and probably won’t ever be. A hobby should be FUN not disheartening! love your attitude! keep up the great work on your blog. your story is inspiring! Fabulous post! I just recently discovered your blog and enjoy reading each of your new posts. I love your Fitness Posts and I usually find at least one every week that I try out. Thanks for sharing your life on your blog! Keep doing what you do!! This is a great post, really sums up the way I feel about blogging on all levels. bagels with pb for the win! LOVE THEM!! girl, you are amazing and this is an amazing post! 🙂 You are totally right — I catch myself feeling this way sometimes and I have to take a step back and remember why I love blogging — not because it reflects what someone thinks is awesome or because it brings in oodles of money — it is because I THINK IT IS PRETTY DAMN COOL and I do not make more than a buck a month and I still enjoy every minute 🙂 Thanks for putting it all back in perspective 🙂 you rock! Each and every one of those is SO true! I love this post! Very well written and I totally agree! What a FANTASTIC post! Seriously, we ALL can related to a bunch of these ideas that you pointed out, if not all of them. Blogging needs to be something you love and do for yourself. As soon as you start worrying about what others want or what they will think of something, it becomes a negative activity and not worth it in my opinion. Great post! I often get caught up in comparing my blog to other people’s, in page views and perhaps accolades and find myself getting jealous, but then I have to remind myself, I started the blog for myself and I write it for myself. I love having readers of course, but that wasn’t why I started it. And social media drives me nuts sometimes–I hate when people pimp one blog entry over and over myself–once or twice and then move on, please! I love this post! And it’s so good to know that I’m not the only one feeling seriously lost in the social media world. There’s always something else I feel like I should be doing! WOW – 139 responses (don’t worry…I won’t compare to my 2 comments I get 😛 ). Absolutely great post. This is how I feel, in a nutshell – reminding myself to not compare. To not worry that my photos may be inferior (or may not get accepted in foodgawker..). To ensure that blogging is fun. I stopped blogging for a whole year almost because it was feeling like a chose. After reading The Happiness Project, I told myself: Only blog when you want to. Only blog when you have time – and it’s still fun. Wow! I know this is an older entry (I just found my way to your blog from Fit Mom in Training), but I just had to comment on what an awesome post this is. As I went down your list I found myself nodding my head at every single one. I’m a new blogger and don’t have much of a readership; I often fall into the trap of comparing myself to all the bloggers who have gorgeous photos, are social media whizzes, get millions of page views, etc. I’m constantly reminding myself that I blog for me, and if I never get more than 10 readers, I won’t regret the work I put into blogging – I just love it. It’s so encouraging to hear all of this from someone who has a fantastic, successful blog. Keep up the great work, it’s inspiring to so many of us! Thank you so much for writing this. Like the reader you just mentioned, I am commenting on this even though it is old. This brought tears to my eyes because I have really been struggling lately with this and it’s so nice to hear someone else feels like this. I love every word of this post!! THANK YOU!! Love this post!! Thank you for the blogging inspiration!! two years after this post, these points are all still so true. it’s so easy to let the love of food blogging slip through your fingers into the pit of comparison & insecurity. thanks for the excellent reminder that it’s what we do because of the joy it brings to us and for the amazing community of people, like you, it ushers into our lives!